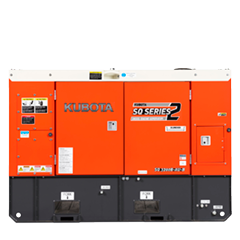 The super quiet SQ Series is Kubota’s largest and diesel generator range, giving you incredible power you can rely on, day in, day out. When you need exceptional performance, excellent fuel efficiency and reduced emissions that won’t blink twice at Australia’s harshest conditions, the SQ Series is the premium choice. The perfect partner for off-grid solar systems with lean battery storage, these heavy-duty, four-pole generators will help you weather any storm. The unique enclosure with noise absorbing duct, oversized muffler, extra-long air cleaner hose and low-noise cooling fan also makes the Kubota Diesel Generators’ SQ Series remarkably super quiet. Plus, it’s durable high performance really packs a punch – whatever you throw at it.